Links We Love: April Edition - Genue Inc.Genue Inc. The “Rococo” period–an aesthetic movement full of pastel colors and glittering cherubs that took place in 18th century France–brings forth a lot of imagery in our minds: the spoiled princess Marie Antoinette in her magnificent frilled gowns and towering hair, among towers of sweet cakes and macarons in glittering ballrooms. It was a time of decadence and feminine glamour! Although this time period was full of it’s own problems, it’s fun to enjoy the romantic aesthetic of delicate lace, floral prints, and gilded teacups. So in this month’s “Links We Love” round-up, we’re all about eating cake in our best party dress! Read on to see how you can join in! In this day and age, the wide pannier skirts of the Rococo era just aren’t practical—but that doesn’t mean you can’t enjoy some girly fashion in the same vein! This floral lace dress from H&M would be perfect for a tea party. Pair it with these vintage-looking pearl “Katherine” hoop earrings from Anthropologie and an elegant updo to feel like the modern Marie Antoinette of your own chic luncheon! But a party in true Rococo fashion isn’t complete without the perfect dishware—how about investing in some vintage china? The Cool Curator on Etsy has a wide collection old-fashioned china and tea sets to choose from. While maybe not from the correct time period, these adorable tea sets ooze elegance! Some of our favorites is are this red and gold teacup and saucer set by Royal Albert Crown China, this geometric gold gilded set by Johann Seltmann Vohenstraub, and this delicate minimalist floral printed set by Shelley Dainty. 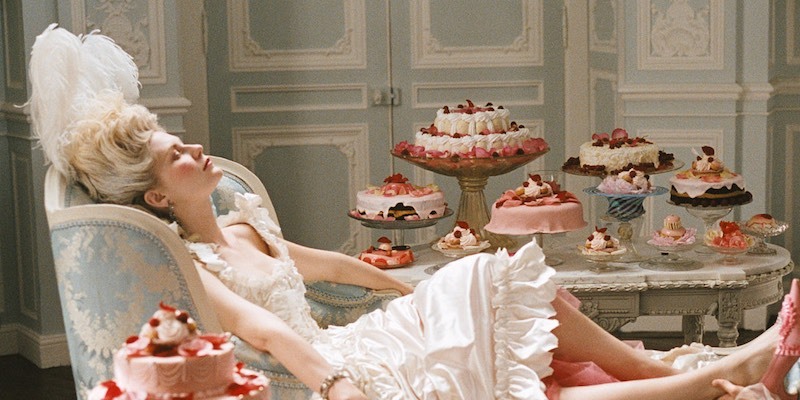 Now, Marie Antionette loved her sweets—“Let them eat cake!”, as her famous saying goes. So how about adding a DIY touch to your desserts? UK-based company Boomf has you covered! Print your own photos and text onto chocolate bars and marshmallows to add a personal touch to your sweets. (A perfect opportunity to create your own unique design using MyGenue app?) Uploading photos can be as simple as linking your Instagram or Facebook account! These cute candies would make the perfect gift for friends and family members with spring birthdays—or just as a treat for yourself! If you’re unsatisfied with re-creating the Rococo vibe in your own home, and adventurous enough to travel, why not visit the grand palace of Versailles in France itself? Once a year, the palace has a grand masked ball where patrons can enjoy the atmosphere of the beautiful palace over champagne and music, with rentable costumes available so that you can get the true historical experience. The whole evening is a fantasy of beauty and decadence. While very expensive (living that lavish Rococo lifestyle was never cheap! ), it would certainly be an unforgettable evening. Who wouldn’t want to feel like a real-life Cinderella for one night?! If you enjoyed this “Links We Love” round-up, check out some of our others: All about flowers and gardening, inspiring minimalist lines by Henri Matisse, and finding elegance in Japanese ‘Tengui’ cloth. Hannah Grace Smith is a freelance artist and writer. She is a recent graduate of Mount Ida College, where she received her BA in fashion design. Her whimsical designs for women and children have a surreal-but-cute style.